These Easy Bean Burritos are made with refried beans and taco seasoning for a perfect easy meal. Tips on how to add in hidden vegetables for a healthier spin on a vegetarian burrito. The first time I had a bean burrito was at a friends house when I was in elementary school. Her father worked evenings so her mom always made easy convenience foods, and the night I visited, she happened to serve us frozen bean burritos. And I LOVED them! Such a simple meal, but I vividly remember it and ever since that meal of bean burritos and canned peaches, bean burritos are something I enjoy often now. I debated even sharing my recipe for bean burritos with you guys because it is beyond EASY. 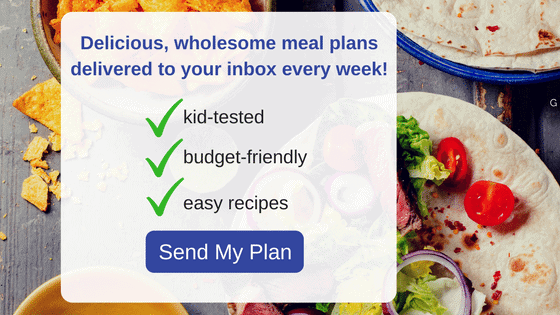 But when I was prepping my kids lunches one day while my sister was hanging out with me, she admitted she never would think to make bean burritos they way that I did and that I should do a recipe post on my tips for how to make bean burritos packed with a hidden gem. You see, I add in pumpkin puree with the refried beans to add in some vitamin A and nutrients to this bean burrito recipe. My sister admitted that her idea of a bean burrito was rolling up some canned refried beans into a tortilla with some cheese. That was all she would ever think to do for an easy bean burrito, but that taking the extra step to add in some vegetables and taco seasoning was genius. And when my sister calls my a genius….I am going to roll with that one! 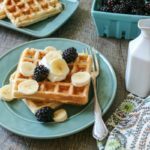 I am a huge believer that it is best to be honest with your children (and picky husband in my case) in regards to what they are eating. Kids need to know that they NEED to eat vegetables, fruits, and other nutrients–they just need to find ways to enjoy them. 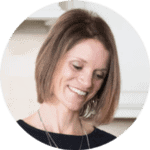 I like to tell them the goal is to get in as many nutrients as we can in a day so that we feel good about what we are putting in our bodies and then enjoy a slice of chocolate cake–that isn’t made with yellow squash or cauliflower puree, when the craving strikes. So when I add canned pumpkin to refried beans for my bean burritos–my kids know the veggies are there. The choice is yours if you tell your kids or not though! There are a few different ways that you can make these easy bean burritos. 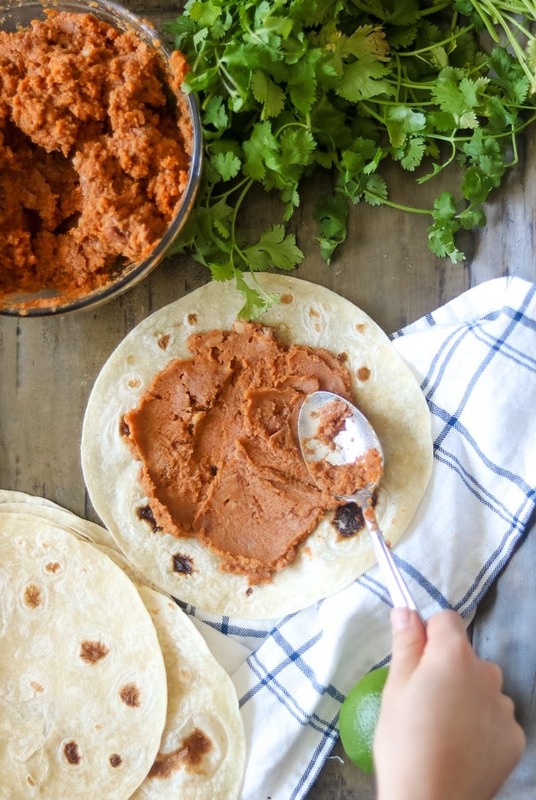 Mix one can of fat-free refried pinto beans with 1 cup canned pumpkin puree and 1 tablespoon taco seasoning. Spread the mixture on a tortilla of your choice and sprinkle with cheese if desired. Heat for 1 minute in microwave or serve cold. Use my recipe for Homemade Refried Beans. Once the beans are cooked, blend 2 cups of the refried bean mixture with 1 tablespoons taco seasoning and 1 cup canned pumpkin puree in a blender or food processor until smooth. Heat in microwave for 1 minute or serve cold. Place 1 cup dried beans in the inner pot of your electric pressure cooker, along with 2 tablespoons taco seasoning, 2 cups diced fresh pumpkin and 4 cups water in the pressure cooker. Set to cook on high pressure for 45 minutes. Once cook time has elapsed and pressure has been released naturally, use an immersion blender to blend the beans with the pumpkin or sweet potato. Spread the mixture on a tortilla of your choice and sprinkle with cheese if desired and heat or serve cold. If you want, you can use sweet potato puree instead of pumpkin puree in these bean burritos. Just be sure whatever puree you use is 100% vegetable–no sweeteners or spices added. Feel free to omit the veggies altogether and use 1 cup more of refried beans. 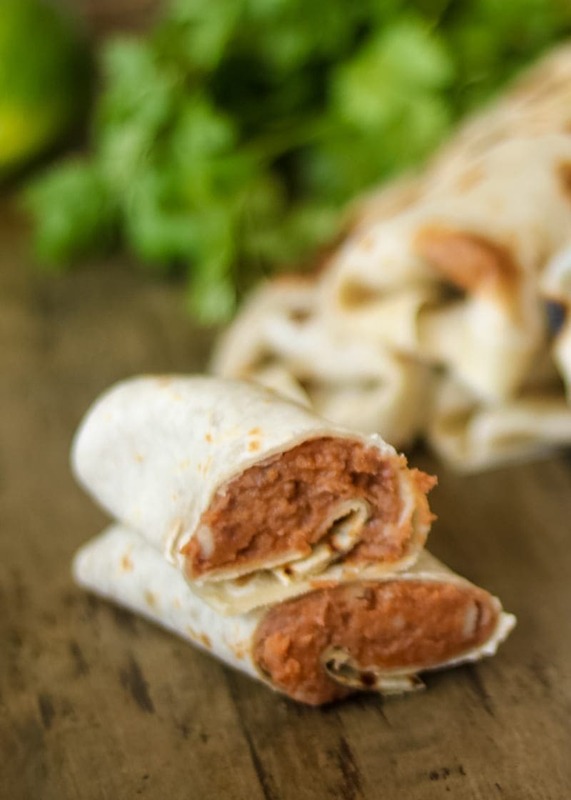 I recommend using pinto beans for these refried bean burritos because the pinto beans pair beautifully in color and flavor with pumpkin or sweet potato. If you were to mix pumpkin with black bean puree the color would be a bit off-putting. To make gluten-free bean burritos, use gluten-free tortilla shells or corn tortillas and be sure to use homemade taco seasoning, as some store bought blends have gluten. If using corn tortillas, be sure to heat the tortillas in a dry skillet for 30 seconds on each side over medium-high heat, making the corn tortilla easier to work with. To make vegan bean burrtios, just omit the cheese. I like to serve these easy refried bean burritos with salsa, diced avocado, lettuce, and sour cream. 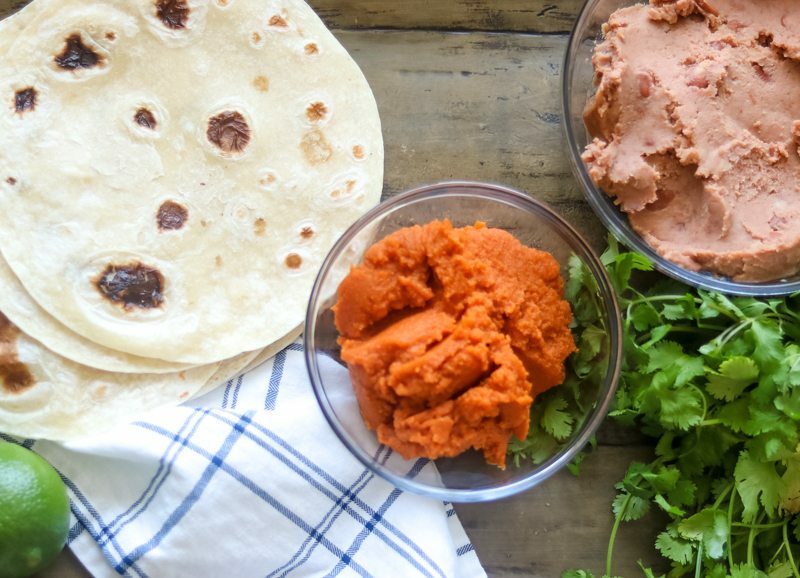 Refried beans are combined with pumpkin or sweet potato puree and taco seasoning for a healthier spin on a classic bean burrito. Mix together beans, pumpkin and taco seasoning. Spread 1/4-1/3 cup mixture on small tortillas and top with cheese if desired. Roll up tortillas and warm in microwave for 1 minute each or on dry skillet over medium-high heat for 2 minutes per side, or until warmed through. I love these easy and yum homemade burritos! Perfectly filling and cozy. These are perfect fuel to power through the rest of winter! Thanks! These are super easy! And I love that you described them as “cozy” that truly is fitting in my mind too. Enjoy and stay warm. These look so amazing. I am a huge fan of bean burritos and definitely try it out. Thanks for sharing! Thanks Cindy! This is a great way to enjoy your veggies too! I tried the recipe with dried beans and fresh sweet potato, I even added a little bit extra beans and it still came out way too runny after cooking in the pressure cooker and blending. I’m not quite sure what I did wrong.